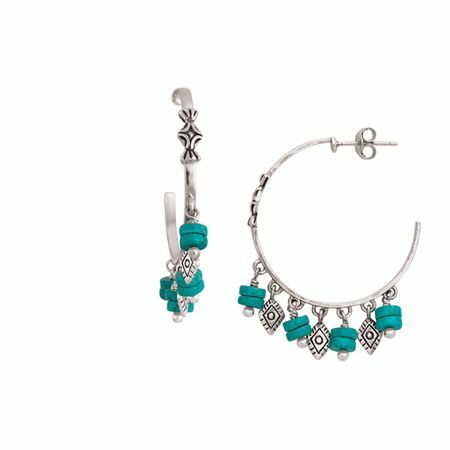 Boasting alternating drops of turquoise-hued beads and diamond-shaped sterling silvering details, these hoops make a statement all their own. Go for a Southwest look by coordinating the Dive In Earrings with cool neutrals, like creams and tans, or add them to yellows and corals for a fun, summery feel. Earrings measure 1 1/2 by 1/8 inches and feature posts with friction-backs. Pieces come with “.925” sterling silver stamps as symbols of guaranteed product quality.